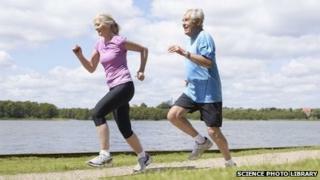 Despite women in their 50s and 60s being healthier and more accomplished than ever, they face "public policy... rooted in the past", a report says. Labour's Commission on Older Women calls for better careers support and workplace flexibility to deal with them taking on caring responsibilities. It claims unemployment among women aged 50-64 rose 41% in two-and-a-half years, compared with 1% overall. It warns of "double discrimination" based on gender and age. The commission has published an interim report for its Women's Conference, running alongside the Labour Party conference in Brighton. "The health of women who are now over 50 is markedly better than previous generations, they have much higher educational qualifications and they have done much more in the world of work," said deputy party leader Harriet Harman. "Many feel that far from being 'past it' they are, with their accumulation of experience, in their prime. We are looking at the public policy implications and demanding change." Ms Harman said that "while so much about women's lives has changed - public policy remains rooted in the past". Recognition in public policy of the "vital contribution to the economy that older women make as carers"
The commission said one of its key findings had been: "Younger age profiles of women in broadcasting, compared to men, both as presenters, in storylines and working off-screen." Labour's shadow women and equalities minister Yvette Cooper said: "Labour will be looking very carefully at the proposals in this report because the generation of women who've broken glass ceilings and paved the way for their daughters and granddaughters deserve a better deal."